Filed to: maybe just talk in person you know?Filed to: maybe just talk in person you know? maybe just talk in person you know? Transition officials worried that if the U.S. and Russia got sucked into a new Cold War, allegations Trump colluded with Russia’s election interference efforts would never end; it’s unclear whether McFarland believed the Russians genuinely did throw the election for Trump or was referring to a possible line of attack from Democrats. In his phone call with Mr. Kislyak, Mr. Flynn asked that Russia “not escalate the situation,” according to court documents released on Friday. He later related the substance of the call—including the discussion of sanctions—to a senior transition official, believed to be Ms. McFarland. A few days later, he briefed others on the transition team. 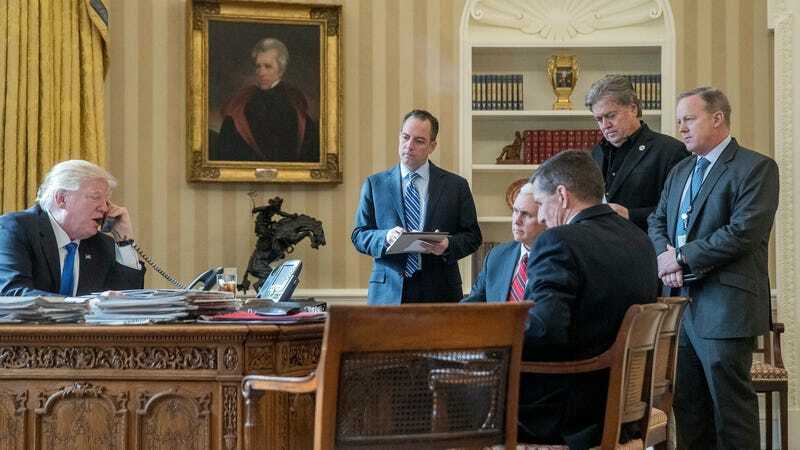 Also, the president-elect was scheduled to talk with Flynn, McFarland, Priebus and Bannon on national security issues the same day the emails were sent. So that’s pretty much everyone now, huh. Trump’s original side of the story—that Flynn acted on his own and that the later firing of FBI director James Comey was unrelated to his investigation of Flynn for lying about it—is completely falling apart. Here’s a tip for the brain trust: Maybe if you’re all caught up in something sketchy, don’t send emails about it, and don’t send tweets about it. At least when Richard Nixon set up that recording system, he didn’t hit CC to the entire internet. Come on, people.